An engagingly told and meticulously researched true story of two women’s race around the world in 1889. I picked this unusual non-fiction book up after a recommendation from Maria Popova of Brain Pickings fame, and was not at all disappointed. Both Nellie Bly and Elizabeth Bisland are fascinating character studies, and offer up a little window into life in 1890’s America – and indeed the rest of the world. In 1889 a female journalist, pseudonym Nellie Bly, set out to race East around the world in less than 80 days. The next day another female journalist, Elizabeth Bisland, set out heading West, aiming to beat Bly back to New York. Over 100 years later Bisland and her later career as a writer have been almost entirely forgotten, but Bly’s investigative reporting and round-the-world trip warrants 10 times more Google search results (40,000 vs 400,000). 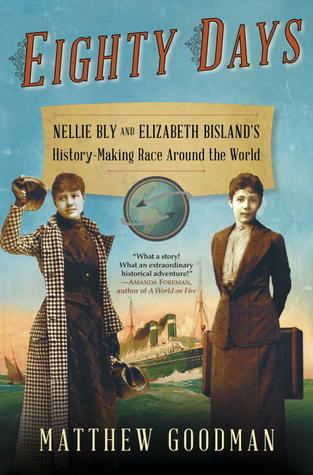 The story of how these two women ended up racing around the world is a fascinating one that reveals many layers of American society, and the race itself gives an interesting insight into British colonial rule at that time. Most interesting of all to me though was the last section and epilogue which deals with their lives after the race, as I think it really highlights the difference that class made to the two women’s lives. The thing that I liked most about this book is its accuracy. There are almost 50 pages of quote attributions and references at the back, and the research has quite evidently been meticulous. To be able to do this and still craft a compelling read is an achievement in and of itself. The descriptions of Jules Verne’s home and library were also wonderful, as was the sheer audacity of a lady racing around the world to beat a fictional character taking time out from her journey to meet the character’s creator. The only time that the meticulous research was a burden was in the first section, which is made up of a series of seemingly endless diversions, on various topics. At times it felt like the author had done so much research he just couldn’t bear for a piece of obscure information to be left unsaid. I am certainly of the opinion that a harsher edit would have made the story more readable, and no less accurate for the loss of some of the more inane topics. Despite this I was fascinated by the inclusion of the story of the Statue of Liberty, it’s installation being funded almost entirely by donations of less than a dollar from members of the working class (many of them immigrants) after Congress refused to allocate the $100,000 needed. Overall this was a terrific true story of two amazing women who deserve to have their stories more widely known. The author said of Nelly Bly that “she had shown for all time that a woman with pluck, energy, and independence could find her way to the ends of the earth and back just as well as a man.” And I think that is a great way to summarise the impact of their trip, frivolous as it may seem on paper to journey around the world for no other purpose than to get home as fast as possible.